You are my favourite excuse to whip cream. Bring the cream, with the vanilla bean, slowly up to almost boiling. Turn off heat and add chocolate. Remove vanilla bean and stir in peppermint essence. Whisk egg yolk and 1/3 cup of sugar until thick and pale. Slowly add the chocolatey cream mixture into the sugar and egg mixture. Once mixed, divide into pots so they are approximately ¾ full. Half fill a baking tray with boiling water, and then carefully place the pots into the water so the water comes to approximately halfway up the pots. Bake for about 30 minutes in a preheated oven at 160C. When set, remove ramekins from water and allow to cool completely. Heat the remaining sugar in a pan slowly, shaking it constantly to ensure it doesn’t burn but dissolves. 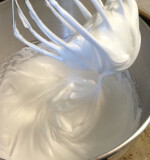 Once sugar has dissolved, pour onto baking paper and allow to set thinly. Once set, break into long shards. Dollop the thick cream onto each chocolate pot, dust with the cocoa powder and decorate with the toffee shard. Top each pot with a mint leaf. Serve with a naughty glint in your eye.